If you keep several objects, usually balls, but also plates, knives, or anything else, in continuous motion in the air at the same time by tossing and catching them, then you’re juggling. If you almost drop something, but you manage to catch it again, you’re juggling too. ‘To alter or manipulate accounts or figures in order to deceive someone’ is also to juggle. Figuratively, when you deal with two or more activities at the same time and you switch rapidly from one to the other, you’re juggling. As a noun, a juggle is the act of juggling. The entertainer juggled oranges and apples. The player juggled the ball, but finally made the catch. The finance director had been juggling the company accounts for years. It can be difficult juggling a career with family and domestic responsibilities. Going to university as a mature student and still earning enough to pay the bills is a bit of a juggle, but Sandra manages it. Juggle dates back to the late 14th century, as the Middle English verb jog(e)len. It came about in English as a back-formation from the word juggler, which had existed in English since around the year 1100, and came from the Anglo-French jogelour and the Old French jogleor. It was probably also influenced by the Old French verb jogler (to serve as a jester or buffoon). Both juggle and juggler can be traced back to the Late Latin verb joculāre, from the Latin ioculārī (to joke or jest), and the Proto-Indo-European root yek– (to speak). It is related to the French jongler and the Italian giocolare, as well as the French jeu, the Spanish juego, the Portuguese jogo and the Italian gioco (all meaning ‘game’), and the English words joke, jest and jocular. Juggle originally meant ‘to entertain by clowning or conjuring tricks,’ and the sense ‘to decieve someone’ first appeared around the year 1400, but the meaning narrowed to tricks of manual dexterity in the mid-15th century. 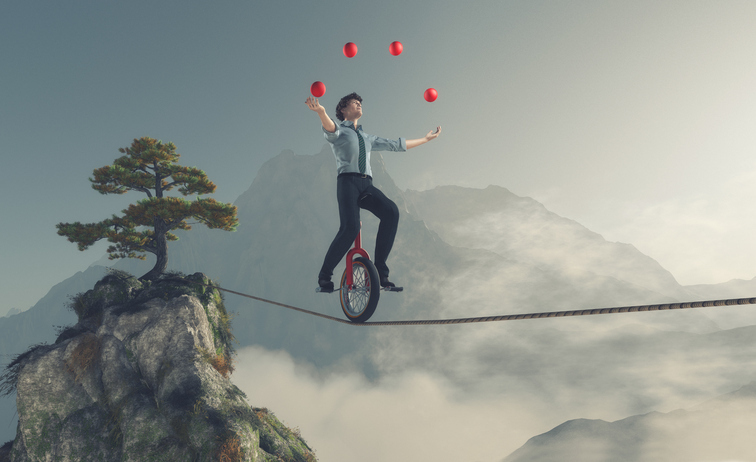 Juggle has been used figuratively, of tasks or careers, since the 1940s. The noun comes from the verb, and first appeared early 15th century.